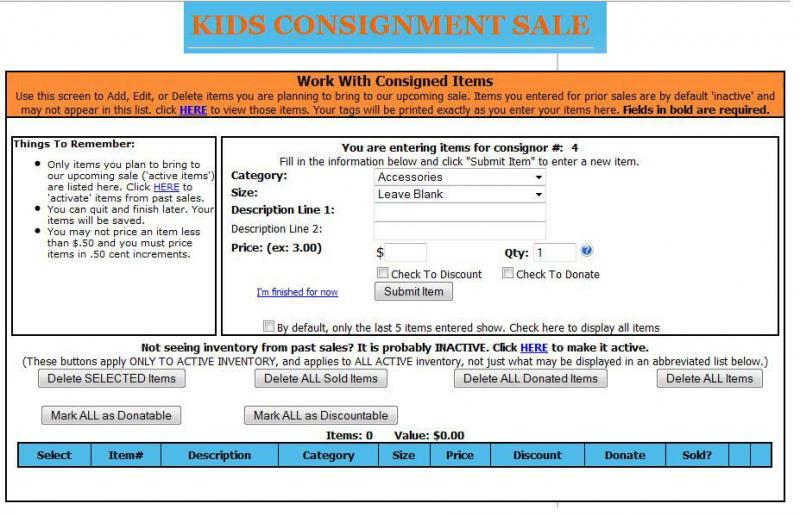 St. Paul's Kids Consignment Sale - Tagging Instructions: Please read this page before tagging! CLICK HERE FOR OUR CONSIGNOR HOMEPAGEThis Homepage allows consignors to update account information, select a drop off time, enter items for tagging, etc. Tagging Instructions: Please read this page before tagging! select a drop off time, enter items for tagging, etc. 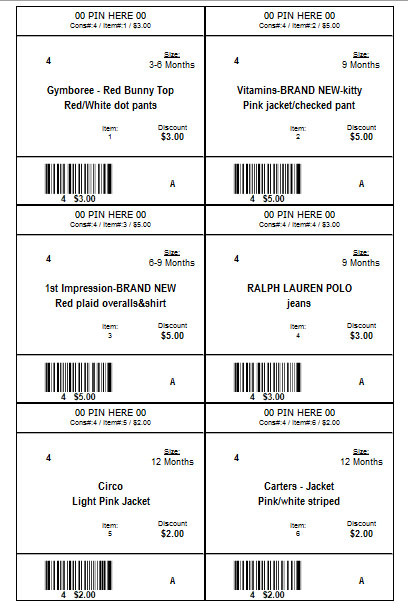 Our new barcode system to enter your items is very user friendly. However, if you have questions, please e-mail us by clicking on the Contact Us page. We’ll be happy to answer your questions. Moving to this barcode/tagging system has made our tags easier to read, more uniform for our shoppers, and sped up the check out process. We may have a few growing pains as we go "digital"; however, we'll ultimately have a much smoother sale resulting in more money in your pockets from happier shoppers. Bar coded tags are required on all items. Handwritten tags will NOT be accepted. ALL items must be entered and all tags must be printed by 9:00 pm on Sunday, September 8th. After this deadline, additions and/or changes can no longer be made to your inventory. The new system allows you to start and stop entering your items as many times as you like before the entry deadline. We’ve found that entering items is faster when like items are grouped together as well as clothing sorted by gender and size. Car Seat Waiver Form - Must be filled out and attached to car seat prior to drop off. FOR PRINTABLE INSTRUCTIONS CLICK HERE! Select Category (all items will need a category) and Size (if needed). Items like toys, books, baby gear, etc will not need a size. Enter a Description: Remember the better the description, the more likely we can match up items with lost tags. Enter a Price: minimum price is $0.50. For Qtyyou would likely use 1 if you only need one tag. However, if you have multiples of a type of item then adjust Qty to the number of tags you will need. For example: you have 3 Carters Pink T-shirts size 2T, you can enter the tag once and enter 3 for the Qty and the system will generate 3 different tags for your T-shirts. Check box if want to Discount. All items marked for Discount will be 50% off the sale price on Saturday for our Half Price Sale. Check box if want to Donate. All items marked for Donate will be donated to local charities after the sale closing. Click Submit Item to enter the item into your inventory. The item will appear below – by default only the last 5 entries will show. If you would like to stop and work on entering more items later click I'm finished for now. This should be used when you have unsold items from a previous sale that you would like to try to sell at an upcoming sale. Please remember those item(s) you move into your active inventory must be acceptable items for the upcoming sale meaning current season items or neutral items such as bikes, toys, books, etc. Click on the box next to the item(s) you would like to sell in the upcoming sale then click Make SELECTED Inventory ACTIVE For Upcoming Sale. This action will move that item or items into you active inventory. If you not are already logged in, you will need to login into you Consignor Homepage. Click Work With Consigned Inventory on the left side of your homepage. Click (Print All Tags) if you are ready to print all tags at once. There should be 6 tags per page. Or click (Print Selected Tags). If you select Print Selected Tags – check box of the tags you would like to print. Use ONLY WHITE Cardstock paper (65lb. or 67lb. cardstock) to print your tags. (available at office supply stores such as Office Depot and Staples) If you would like smaller quantity of paper, card stock is available for purchase by the sheet in the Business Center at Office Depot. Don't use heavier paper that could soak up ink causing the barcode not to scan properly. Six tags will print on one sheet of cardstock. Each tag will be measure approximately 3 inches by 3 inches. Set ink jet printers to "normal print quality" setting NOT "high print quality”. Before printing make sure you browser allows for pop-ups. 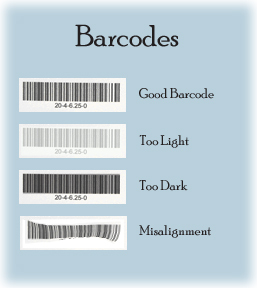 Below is an example of good and bad barcodes. Clothes must be on hangers, clean and pressed with no stains, missing buttons, broken zippers, or rips. Safety pin skirts and pants to top of hangers. NO clothespins or straight pins. Shoes must be in a Ziploc bag (one pair per bag). All toys and baby equipment must be clean and in good working order with ALL parts secured with clear packing tape. Small items, i.e. diaper covers, small toys, bottles, rattles, etc. may be grouped in a Ziploc bag. Tape bags closed with clear packing tape. ALL tags must be printed by 9:00 pm the Sunday before the sale. WHITE CARD STOCK ONLY (65lb. or 67lb. card stock), no copy paper, to print your tags. Don't use heavier paper that could soak up lots of ink, the barcode may not scan properly. Must use NORMAL print setting and use "Black Cartridge Only". Six tags will print per page and each tag should be approximately 3 inches by 3 inches. 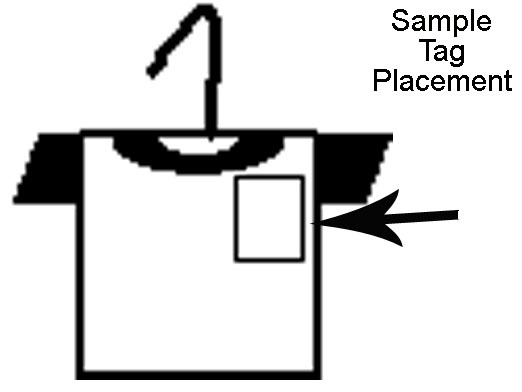 All clothes must be tagged with a specific numerical size—such as 2T, 4 or 8—or they will be rejected. If manufacturer has tagged the item small, please estimate what numerical size is most appropriate. You set your own prices. No items under $0.50. Please round all prices off to the nearest half dollar. For bagged items, all tags must be on the OUTSIDE OF THE BAG and secured with clear packing tape. Tape tags with clear packing tape on toys, equipment, etc. No masking tape. For a multiple piece item use only one price tag. We recommend handwriting additional tags referencing the original price tag. For example on the handwritten tag “piece 2 of 5, consignor 4, item 155”. We are not responsible for items lost, stolen, tags switched, items separated from their tags or prices changed.